Thanksgiving is slowly sneaking up on us and the food pictures on social media are already beginning! 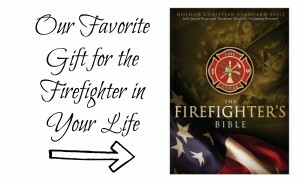 Everything looks so great, I know that I am looking forward to the feast but… Our Fit Fire Wife fire wife, Beth McDowell, has a new challenge for us just in time for the food and uncountable sweets, let’s hear what she has to say. Can you resist all of the holiday over-eating? I know that sounds difficult, but think off all the hard work that we have been working for in the past few months in the FIT FIRE WIFE group! Don’t let all those miles and exercises go to waste over the holiday. Trust me, I understand. 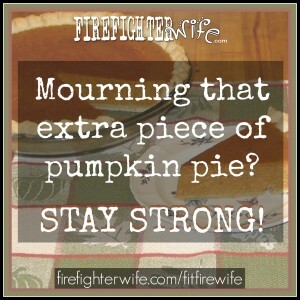 I will be taking time to mourn over that extra piece of pumpkin pie I have to say no to. We do not want to over-eat. We do not want to have that extra piece of dessert. We do not want to let the stress fill our faces with more food as a relief. We DO want to have portion control, healthier options and allowing ourselves to have that small dessert because depriving ourselves of those things is not a healthy habit. Everything in moderation! We’ll be trying to keep the group motivated and encouraged to enjoy the holiday without regretting it later. We want you to enjoy the food without erasing all of your hard work. So many of you have come so far! 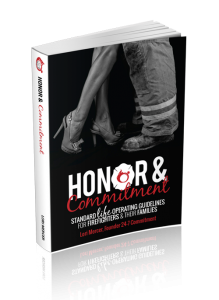 *Click HERE for more on the Fire Wife Sisterhood memberships and if you want to learn more about our Fit Fire Wife Program, click HERE.